Partner Visa approved in only 9 WEEKS!! Congratulations to our clients Beng Yee & Derek! 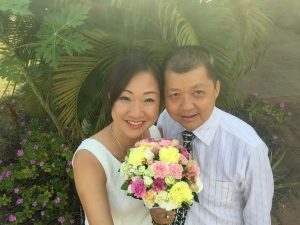 Beng Yee is from Malaysia and we got her Partner Visa approved in only 9 WEEKS! We lodged the visa application in June 2017 and the Department of Immigration approved it in August 2017! Currently the usual processing time is 13 to 16 months for offshore partner visas, and 18 to 21 months for onshore partner visas. You can check the official processing times of the Department of Immigration here. We have a 100% success rate with our Partner Visa applications. We always lodge comprehensive and well-prepared visa applications with all required documentation which makes it easier and faster to get your visa approved. Contact us now and speak to our Partner Visa Specialist! Or click here to find out more about Partner Visas and how we can help you. Happy clients: Beng Yee and Derek – partner visa approved in only 9 WEEKS!! 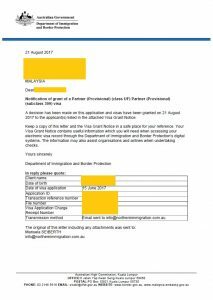 Visa grant letter for Partner Visa approval in only 9 WEEKS!! Congratulations on your success! 9 weeks is very fast for a partner visa. I would like to live with my partner in Australia. Can you help me? I’m a Permanent Resident in Australia. I want to sponsor my partner but his visa got refused. He don’t have another option and he just have 28 days left. Can you please help us! It’s really hard for me to live without him. Thank you. Sorry to hear your partner’s visa got refused. We are more than happy to help you. I suggest you book a consultation so we can assess the refusal and advise you and your partner about his immigration pathways and options, e.g. application to appeal the decision. We are looking forward to hearing from you! I would like to apply for a Prospective Marriage Visa for my partner. We have been together for 4 years and I am pregnant. I am a born Australian citizen and have lots of proof but would like an agent to help us keep on track. I have been reading your website blog and follow you on Facebook and Instagram. You have very good ratings and reviews and we would like you to be our migration agent! How much is your fee? Thanks for your enquiry and your feedback. Congratulations on expecting a baby! That’s very exciting! Of course we can help you and your partner with your Prospective Marriage Visa. Please contact us for a quote!